The rapid advancements in technology have given rise to countless opportunities for businesses to utilize technological innovations to improve their various processes and improve their productivity. A wide range of software and hardware systems are now available to manage, monitor, and even automate almost any business function, thereby providing great potential to improve their efficiency in delivering whatever services they provide. There are plenty of systems that can automate inventory management, aid in human resource management, and even help engage with clients and customers. One of the most popular companies that provide a complete collection of systems and platforms that offer solutions to businesses is SAP®. In this article, we explore what SAP® has to offer businesses and take a look at the value of hiring SAP® consultants in helping businesses become more efficient and productive. Formed in 1972 by five former IBM engineers, SAP® is a German software company that had humble beginnings. The company started with just a single customer, for whom the hybris developers created a payroll and accounting system. The vision of the hybris developers to infuse technology into business functions quickly showed promise, and after two years of operation, the company’s client base grew to 40. Their services likewise expanded as the company began to offer solutions to inventory management, transaction and purchase handling, as well as accounting. SAP® has since continued to grow. Currently, the company has offices in over 130 countries and has over 365,000 clients from 180 countries in various industries such as banking and insurance, airlines, media, automotive, healthcare, and education, among many others. The company claims that over 87% of Forbes Global 2000 companies are their customers. After 45 years of operation, SAP® has grown to be the third largest software company in the world, according to Forbes. SAP® mobile application development offers a wide range of enterprise solutions to businesses. One of its most popular services is SAP® ERP, which offers an Enterprise Resource Planning (ERP) system to businesses. An ERP system is used to streamline the management and monitoring of a company’s different business processes so that tasks that previously required separate and disjoint tools can now be performed through a single system. As a result, with a SAP® ERP system, managing the various business processes can be done much more efficiently, and the stored data from these operations can easily flow from one process to another. Another noteworthy service of SAP® is SAP® CRM, which offers a Customer Relationship Management (CRM) system to businesses. Such a system processes all data related to a company’s customers or clients and provides a platform to manage interactions with them. The goal of a CRM system is to establish a better relationship between the business and its customers, and ultimately, to improve customer retention rates. Aside from CRM and ERP software, SAP® mobile application development also offers many other products in nearly every business aspect in existence, including cloud platforms, business intelligence and analytics tools, finance and accounting systems, human resource management software, and the like. With the overwhelming number and types of service SAP® hybris development products provide, a SAP® consultant will be very valuable to a business in determining which product fits its needs the most. A SAP® specialist will also be the one to make sure that the implementation of the system across the business is smooth and efficient, and that it integrates well with other systems and even with other SAP® hybris development systems when multiple services are availed. 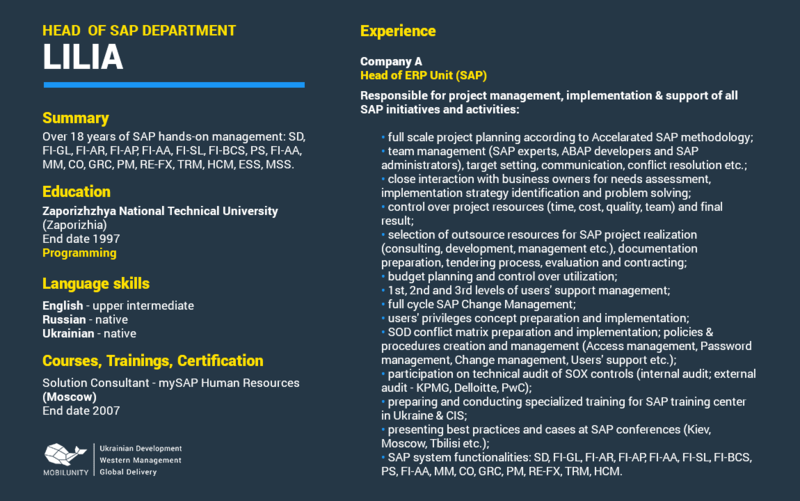 To better help you choose a great SAP® consultant that can provide guidance with various SAP® jobs, here are some important things you should look for in a SAP® hybris expert. The most important skill, and perhaps the most obvious one, that an excellent SAP® specialist should possess, is the deep knowledge of the different SAP® services. This will enable him to ensure that the most appropriate product is selected for the business. Furthermore, businesses can avail of multiple SAP® products, and since the domains of the various SAP® products may have large overlaps, the SAP® consultant should be well aware of how these products may be integrated with each other. A SAP® specialist should also be skilled in using advanced features of the SAP® products, such as using the SAP® APIs. These APIs make SAP® products even more powerful as they enable businesses to extend and customize its features and to ensure that the SAP® systems they implement are perfectly integrated with the other systems in use by the business. A SAP® consultant should therefore be aware of which APIs to use for different purposes. SAP® systems involve processing of vast amounts of data, as well as integration with various database systems. A good SAP® consultant must have a great understanding of data management and data analysis in order to understand the different features and visualizations presented by the different SAP® products. He must also have some knowledge in the different database systems to which these SAP® products may connect. Knowledge of the various SAP® products and their advanced features may be valuable, but actual experience in using and implementing them is also critical. A SAP® hybris expert must have had a lot of experience in implementing such systems in different companies from various industries, including integrating SAP® systems with different external systems. He should also have a lot of experience in implementing different combinations of SAP® products within businesses and integrating them with one another. Before jumping into the implementation stage of a SAP® product, the very first step that a SAP® consultant should take is to understand the nature of your business, its various functions, operations, and processes. He should be skilled at extracting the right information and asking the proper questions in order to quickly and methodically lay down the different aspects of your business. He should also have a thorough understanding of the inner workings of standard business units such as HR, accounting, payroll, management, and the like. The SAP® tools suite provides an abundance of products to help businesses achieve greater productivity. A SAP® consultant plays a critical role in ensuring the smooth and correct implementation of the right products within a company. If you’re in the market for SAP® consulting companies or you wish to hire excellent SAP® hybris experts, we’re the perfect partner! We are Mobilunity, a provider of dedicated IT professionals who are skilled and proficient in SAP® and many other technologies. Located in Ukraine at the very heart of Europe, we provide exceptional talents at incredibly affordable rates. With us, you’re certain to minimize your expenses and maximize your profits. Reach out to us and we’ll help your business achieve its goals in no time! Disclaimer: SAP® ERP, SAP® CRM are the trademarks or registered trademarks of SAP SE in Germany and in several other countries.